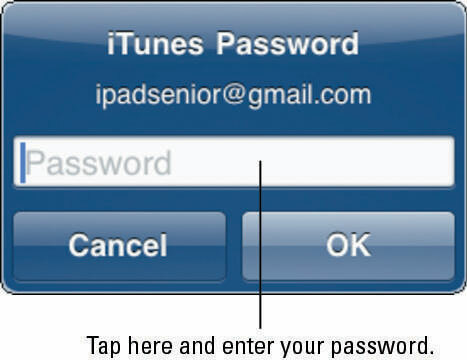 Using the iTunes Store from your iPad is easy with the preinstalled iTunes Store app. 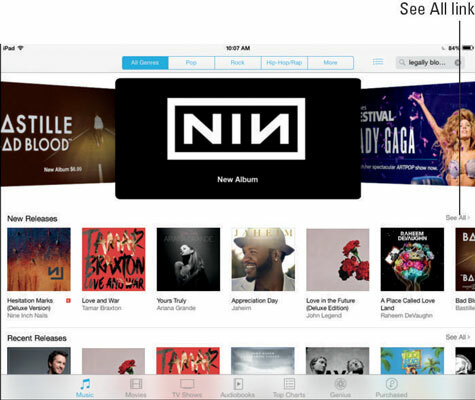 You just tap the iTunes Store app on the Home screen. Now you can roam around trying different options. You have music, movies, TV shows, and audiobooks to choose from. If you begin to purchase or rent an item and you’re not already signed in with your Apple ID, the dialog shown appears, asking for your sign in information. Enter your ID and password (you may have created one when you set up your iPad or may have already had one) and tap OK.
Start exploring musical selections by tapping the Music button in the row of buttons at the bottom of the screen, if it’s not already selected, as shown. Tap the See All link in any category of music to display more music selections. Tap the Music button in the upper-left corner to go back to the featured Music selections, and then tap the More button at the top of the screen. This step displays a list of music categories that you can choose from. Click one. Items in the category are organized by criteria, such as New and Noteworthy Albums and iTunes Essentials. Tap any listed item to see more detail about it, as shown. The navigation techniques in these steps work essentially the same in any of the content categories (the buttons at the bottom of the screen), which include Music, Movies, Audiobooks, and TV Shows. Just tap one to explore it. Podcasts and iTunes U (courses) used to be accessible through the iTunes Store, but now you have to install separate apps to get and run them on your iPad (you can still shop for all these items in the iTunes Store from your computer). Go to the App Store and search for Podcasts and iTunes U, and install these free apps to get access to this additional content. If you want to use the Genius playlist feature, which recommends additional purchases based on the contents of your library, open the iTunes Store app on your iPad and tap the Genius button at the bottom of the screen. 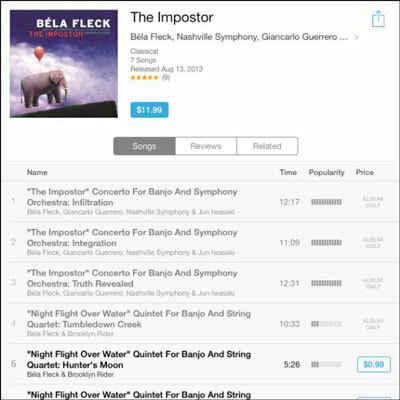 If you’ve made enough purchases in iTunes, song and album recommendations appear based on those purchases. You also see the content in your iTunes Match library if you have one.